If you're planning a visit to China and you want to spend some time away from the hustle and bustle of the big cities...you'll be lucky! Escaping the craziness is pretty much impossible, but you can escape the big cities, and in fact, you should. There are many famous ancient historical places to visit in China like "The Great Wall, The Terracotta Warriors and numerous Shanghai Temples, but let me tell you about a place popular with Chinese tourists, that is still a bit of a secret to westerners who are visiting this great ancient land. Credit: Credit: Photo Credit: melenama via Compfight cc"
Fenghuang - meaning "Phoenix" in Chinese - is located in Hunan Province. It is of course named after the mythical fire bird, which in Chinese is a symbol of longevity and also considered to be a good omen. As legend has it, the town gained its name when one day, two Phoenix birds hovered over the town for a very long time, finding themselves reluctant to leave because of the towns stunning beauty. Fenghuang is one of those places that can take your breath away. You may easily find yourself lost in a daydream... Feeling like you are wandering around in some mystical, ancient fairytale land. Fenghuang is a mixture of mountains and rivers, wooden houses built on stilts, precariously hanging over the water's edge and greenery abounding in every direction that you care to look. Visiting Fenghuang will give you a real taste of what village life was like before the onset of modernization. Even amongst the masses of Chinese tourists who flock here all year round, you can still feel the magic as you meander around the laneways, soaking up the atmosphere. Credit: chopsooyUnfortunately, Fenghuang is not exactly easy to get to. There is no airport, no train and often bad roads leading to your destination. 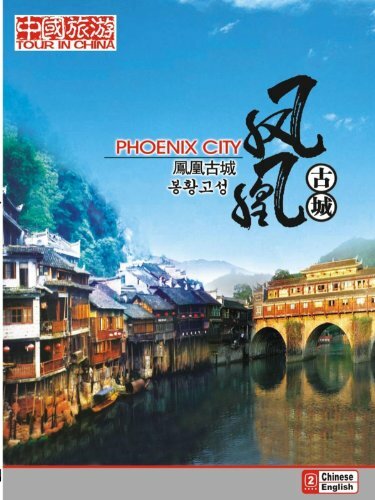 The closest port of call from which to catch either a taxi or a bus into Fenghuang is at a city called Jishou. Buses run roughly every 30 minutes, and the journey takes about 70 minutes. Taxi drivers are well used to doing this journey, and it is not difficult to find one outside of the Jishou Railway station. Organise the price with the driver before you leave. As with everything in China, be prepared to haggle a little to decide on a final price. Credit: Photo Credit: <a href="http://www.flickr.com/photos/10630381@N03/1656637283/">magical-world</a> via <a href="http://compfight.com">Compfight</a> <a href="http://creativecommons.org/licenses/by-sa/2.0/">cc</a> Paste this HTML on your web paFenghuang is particularly famous for its delicious Ginger Candy. Watch as your Candy is beaten and stretched into shape by the candy makers who are dotted all around the streets, and choose between the plain or slightly more spicy variety, it really is delicious. If you've a sweet tooth but ginger candy is not really your thing, try the dried kiwi fruit - it's very tasty. For those wanting to spice up their life a little, the aroma of "Red Chilli Pickles" can be smelt all over town, or for another slightly unusual delicacy, you can't help but notice the dried- smoked pigs faces staring at you from all angles. Smoked pork is actually very tasty, if you're game to try that is! For general meals, Fenghuang's old town is chock-a-block full of street vendors and restaurants selling grilled meats and seafood, flat breads, dumplings and all other Chinese cuisine. China has 55 minority groups - that is everyone who doesn't belong to the Han majority. In Fenghuang you will mostly see the Miao or Tujia ethnic minority groups lining the streets in their bright costumes. Selling silverware and crafts and singing ethnic songs, these local people are happy to mingle and try to converse with you, as you bargain with them on all their beautiful crafts and wares. If you are the type of person who enjoys a bit of night life, don't be fooled into thinking this little river town will peacefully rest of an evening, it is in fact quite the opposite. As the sun goes down, the bars light up and burst into life. You can indulge in music, bands, food and alcohol, all whilst perched over the river... It is certainly an experience you will remember. Another fun thing to do in the evening is to buy a hand-made paper boat, complete with a candle, make a wish and float it off down the river. You can find many women and children who make a little extra money by making these for you to purchase and it's fun to buy a few and make their day end happily. Credit: chopsooyFenghuang is such a small little village, that I really recommend that you don't take part in the crazy Chinese tour group outings that often happen here in China. They will only lead you around to all the museums (which you can find for yourself) at a break neck speed and sleep you in an average hotel, probably far from where you want to be situated. Unlike big cities such as Shanghai and Beijing, this little town is very easy to wander around and find what you want to see, at your own pace. As far as hotels and places to lay your head for the night, there are hundreds of small places and they really don't mind if you ask to see what the rooms are like. If you want to be totally sure you have a place to stay, C-Trip now is also in English. It is a Chinese travel and accommodation website, that comes highly recommended amongst Chinese people. If it is history and museums that you are interested in, there are plenty of places to visit most of which will require you to purchase a ticket upon entry. Credit: chopsooyI have been to Fenghuang twice. The first time on a tour with which we saw all of these places listed, and the second time a leisurely holiday at our own pace. Whilst the first one or two museums that you enter are a little interesting, they start to look the same by the time you get to number three. I suggest walking around, seeing what you like the look of and forget about the other museums. The best fun to be had in Fenghuang is by absorbing the atmosphere, browsing the market stalls, trying the food and watching the people - who still do their washing in the old-fashioned way by beating it on the river's edge. All of these experiences are free and much more interesting than the museums. A boat ride down the river - It gives you some of the best photo opportunities and a chance to get involved in a sing along...even if you don't understand the words! A ride in a traditional Chinese Jaozi carriage -If you don't mind being stared at, and wish to be carried along like they used to do for marriage ceremonies, You'll enjoy 5 or 10 minutes of being jogged along through the streets. It's all done in the spirit of fun and great for a bit of a laugh. Have a look for yourself in the video below. If it is somewhere extra special in China that you want to travel to and see, somewhere that most westerners don't even know about, then I highly recommend a visit to magical Fenghuang. Bring some wet weather gear as it stays looking green for the obvious reason, it's very damp and misty, but really worth the extra effort you'll need to take in getting there. Do you need even more convincing about how beautiful Fenghuang is? Then you may need this! It should be noted that as from the 10th of April 2013, they have started charging an entry fee to enter the town. The initial news report stated RMB 168 yuan entry fee, however, travel sites are all saying different things with prices ranging from RMB248 yuan (for top 11 attractions at Fenghuang, 9 inside the ancient town and 2 outside), the other is RMB138 yuan (for the Fenghuang Ancient Town only). Another site states RMB148 yuan (1 ticket only), so taking all this into consideration... if you allow for around RMB150 yuan, which is about $25.00, you should be right. This has apparently been put into place to gain funds for restoring and keeping the town in tip top condition, but it has caused nothing but trouble and complaints. Apparently a substantial blow to Fenghuang's tourism industry has already been noticed. It's my guess these are the reasons for the varied prices everywhere. I will keep an eye on this and update this article as news comes to hand and prices re-stabilize. Fenghuang sounds like a fun place to visit. The ginger candy pulling looks like fun too. It made me remember when I was little, and I used to do something similar with my mom and siblings. Molasses Taffy we called it. Your pictures are beautiful. Very beautiful place. I really like the first picture and the eerie effect it has. Thanks for bringing to our attention an alternative, lesser-known destination. EliasZanetti, You're very welcome. Thank-you very much for reading and commenting. There's a mix of my pictures and others pictures in this article...I agree the first picture is pretty cool...unfortunately the credit for that one doesn't go to me :-) thanks to melenama via Compfight for that one. This is such a great article! You have a way of describing things that makes me feel like I'm there. It really drew me in. I love the country, but the city stuff would be like going to a carnival. Just experiencing the culture itself would be fun, new and exciting. Thank you for sharing. Hi appersonal, thank-you very much for your kind words, much appreciated. Yes city's are often all much of a muchness, but getting out into the countryside towns is a jaw dropping experience. Everything is so very different and as you say fun, new and exciting! Cheers again, for taking time to read and comment.